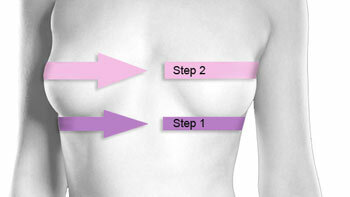 Measure around the body directly under the bust while wearing a bra. Round up to an even number if necessary. 43" + 1" = 44"
This indicates the frame size. This is the bust line measurement. The cup size is determined by the difference between the bust line measurement and the frame size. Compare bust line measurement to the frame measurement. If the difference is 1" 2" 3" 4" 5" 6" 7" 8"